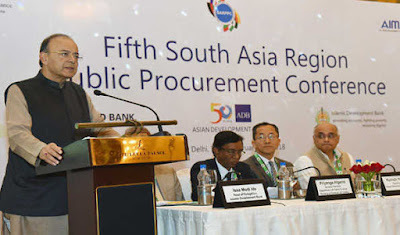 The Fifth edition of South Asia Region Public Procurement Conference was held in New Delhi from 5-7 February 2018. The conference was hosted by Public Procurement Division (PPD) of Ministry of Finance and All India Management Association (AIMA). It was held under auspices of South Asia Region Public Procurement Network (SARPPN), which is sponsored and facilitated by the World Bank, Asian Development Bank and Islamic Development Bank. The conference was inaugurated by the Union Minister of Finance and Corporate Affairs, Shri Arun Jaitley. The First Conference was held in Kathmandu in 2010, second in Islamabad (2014), third in Dhaka (2015) and fourth in Sri Lanka (2017). All eight SAR countries spend approximately $550 billion equivalent on public procurement of goods, works and services, which eventually convert to public services. The basic objective of all these conferences was to achieve mutual knowledge exchange. The theme this edition of conference was “Public Procurement and Service Delivery”. The basic objective of this conference is to strive to improve public procurement of member countries to ensure timely and quality delivery of public services. It aims to enable heads of Public Procurement and other key stakeholders in 8 South Asian countries (Bangladesh, Bhutan, India, the Maldives, Nepal, Pakistan, Sri Lanka and Afghanistan) to meet and learn from one another and from experts in field of public procurement. It will help South Asian Governments to consider enhancements and innovations in their public procurement systems, enable efficient utilization of public resources, and ensure quality and timeliness in delivery of services. This Conference was attended by the Senior Government Officials of South Asian countries in addition to the World Bank (WB), Asian Development Bank (ADB), Islamic Development Bank (IDB) and other agencies. The Conference will deliberate upon key aspects of public procurement that help ensure delivery of these services; and identify and address areas that need improvement. Various sessions were conducted in this 3 days conference which laid emphasis on the procurement of health and education services, enhancing oversight in public procurement through complaints mechanism, audits, etc., role of ICT and PPP in public procurement, etc.